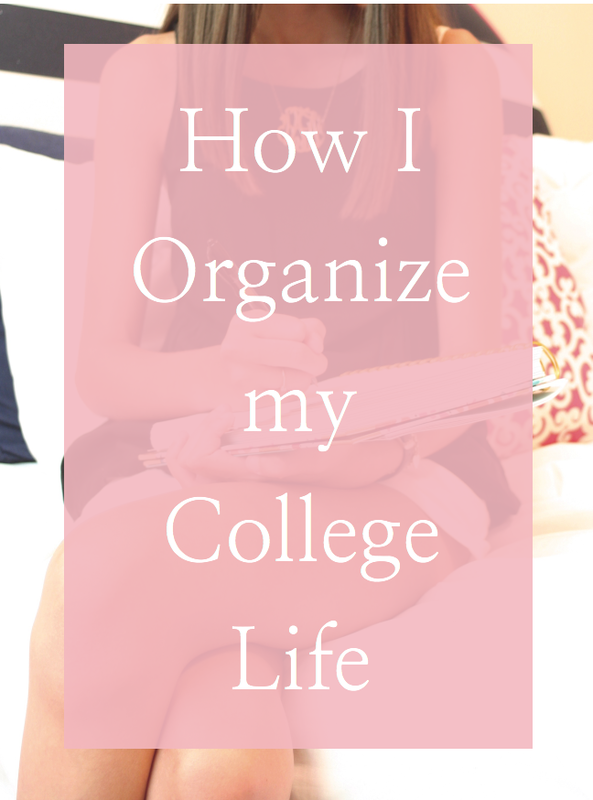 I'm so excited to write this post because I absolutely love organization and have found my organization system to be working really well for me! I know for some people this whole system may be intense, I use upwards of 4 calendars, but you can always just take away and use whatever aspects appeal to you. This system definitely took some initial time at the beginning to get going, but now I spend very little time on it. Alright, so bear with me as we get going on this probably fairly long post! The first thing I suggest doing before all else is to assign colors to everything that is a big part of your life. For example, I assigned each of my classes, my blog, personal, work, and general school events a color. I chose blue for my religion class, so now everything regarding religion is in blue. This really helps you to stay organized and if you want to take it up a notch I suggest matching the colors you chose for your classes to the notebook/binder for that class. Why I love it: This is probably the most simple calendar I use. 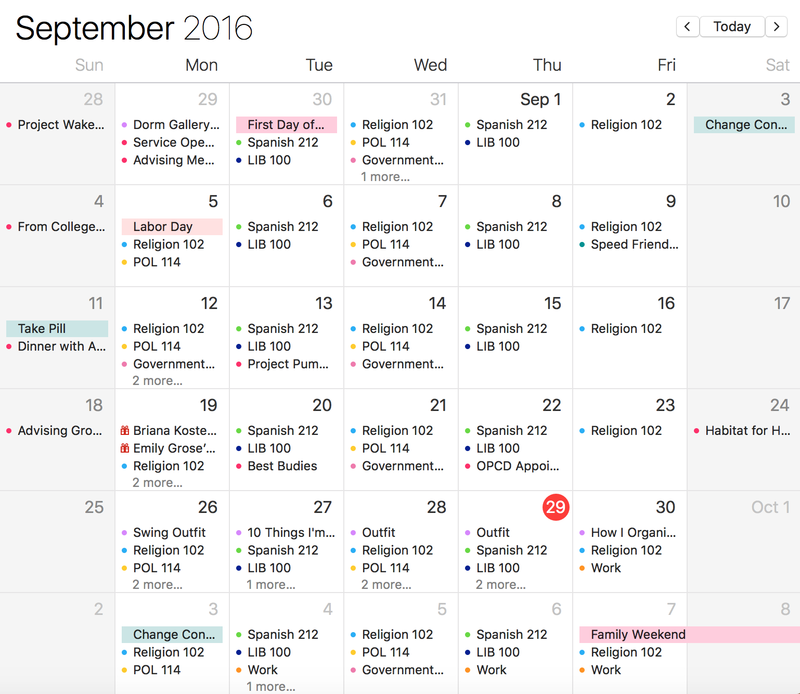 I just really like it because I like to be able to see the whole month laid out and what big things I have going on. I also use colored pens that correspond with my colors to label things! What I use it for: So on this calendar I put things like football games, school events, visitors, days off, etc. I also like to cross through the days as I go, I'm not sure why it is just something I've always done! So it also serves as a count down in a way. When I plan with it: At the beginning of the month I write down everything that I know is going on and then update it as new things come up. Plus it hangs on my desk so it is great to reference while doing homework! 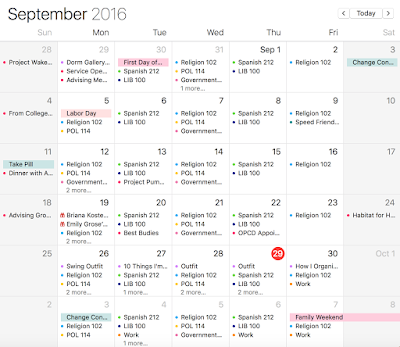 Why I love it: I love using an online calendar, because if you have your phone you can always check it. 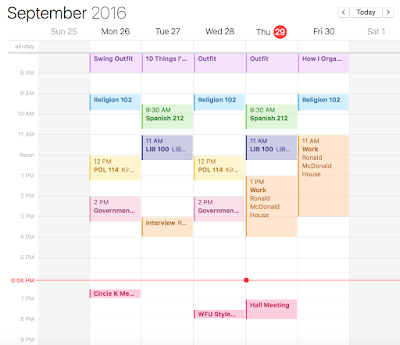 It is great for when you are making plans with someone and don't want to pull out your full planner. It is also great because you can see many different views: monthly, weekly, and daily. What I use it for: I put pretty much every planned event in here: class, events, work, meetings, etc. I like this because you can easily see when you have time to fit in that hour at the gym or more realistically that trip to the mall. When I plan with it: This requires a lot of initial time putting in all of your stuff but you can make things recurring so it requires little maintenance later on. Not going to lie the monthly view stresses me out a lot, so I hardly ever use it. This is the view that I am using 99% of the time. It is so easy to look out and helps me see what blocks of time I have to do different things. I don't usually use the daily view because you can see it pretty well in the weekly view, but it is nice to have! 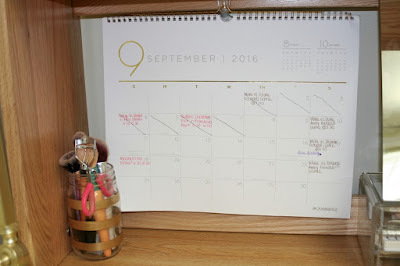 Why I love it: I have the Day Designer planner so it has an hourly schedule and a to-do list for each day. I use both obsessively. What I use it for: My hourly schedule has everything. I write when I'm going to eat meals, go to class, do homework, do laundry, etc. 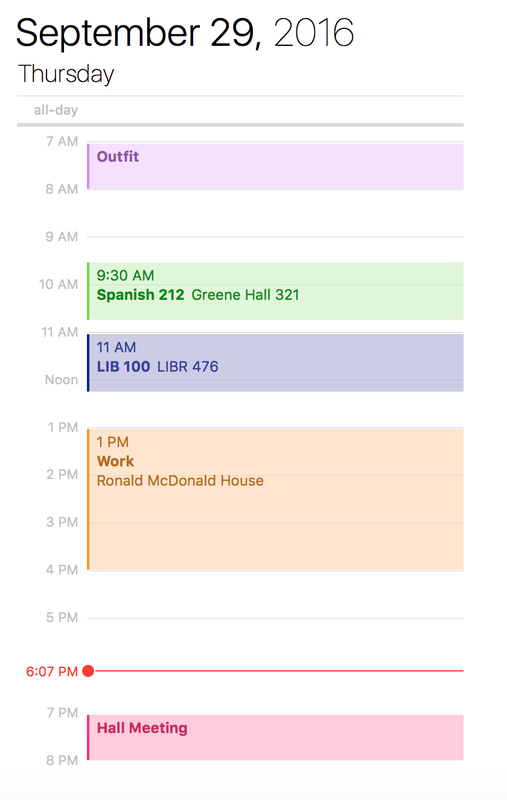 EVERYTHING, I spare no detail in planning out my day. I fill in every hour of my day because for me that helps me to be productive. If I know I have to do something at this time than I get it done and don't mess around! The to-do list is also great, again I write everything: from go get mail to post an Instagram to homework assignments. The Day Designer also allows you to pick a top 3, which are the three most important things to accomplish that day which helps to keep you on track and prioritize when you have a lot going on. When I plan with it: I usually try to update my Day Designer for the next day before I go to bed and if not definitely in the morning before class. Check out my full post on the Day Designer here! 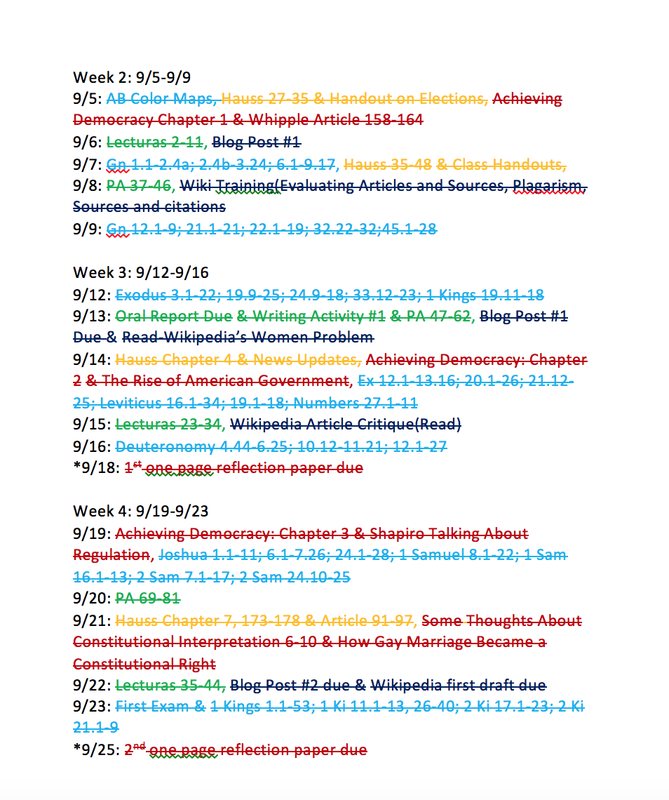 Why I love it: I decided to create this thing that I like to call the mega-syllabus at the beginning of the semester. 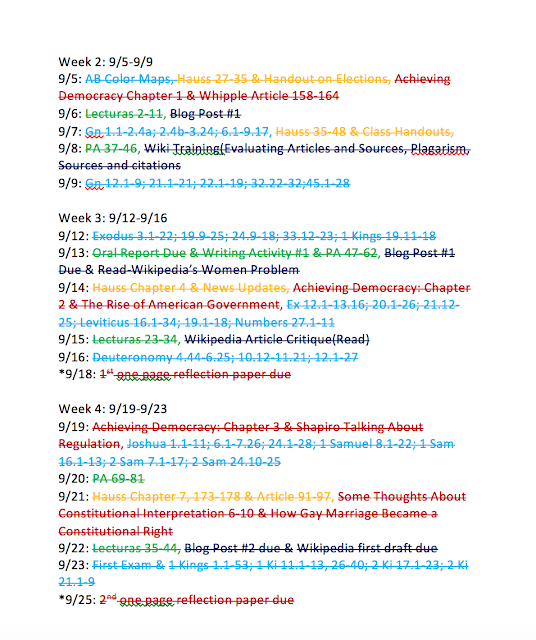 Basically I put everything from the syllabus for each class on to one giant word document. 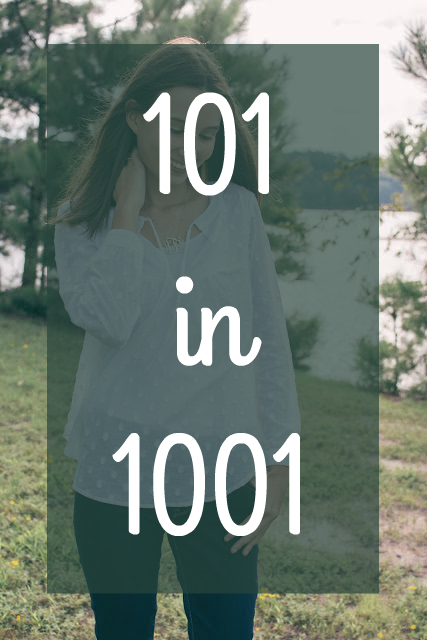 This keeps everything together so you don't always have to flip through your syllabi. 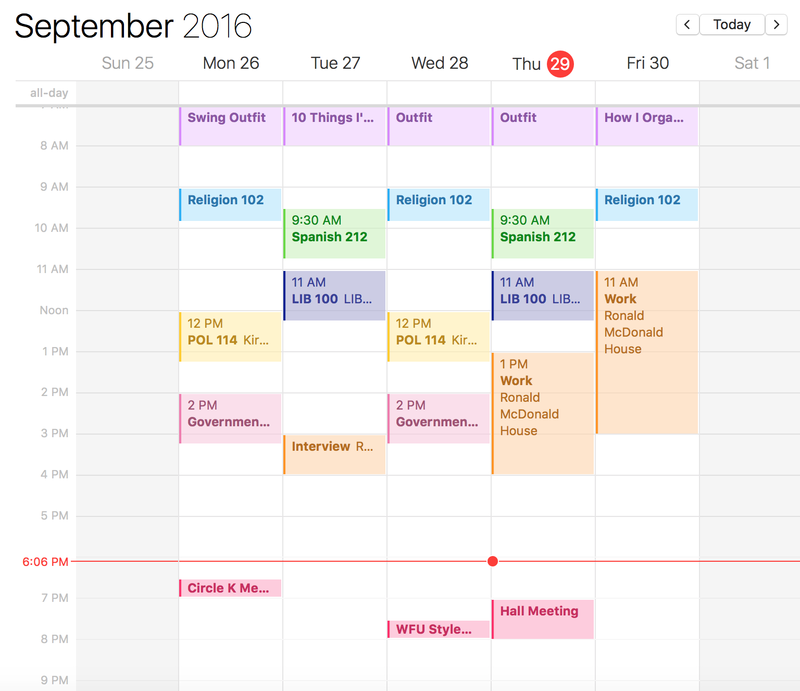 I find that I love this the most because it allows me to see everything I need to do that week and plan how I will accomplish it. 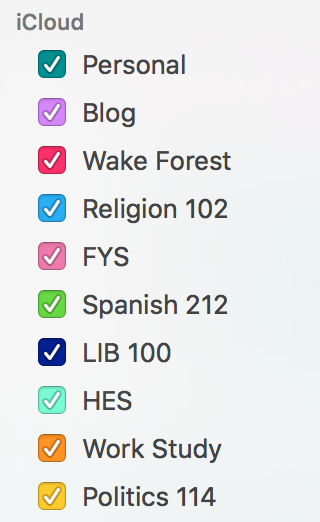 What I use it for: Each classes assignments are written in the designated color. On the day I'll either write the assignment that is due or the homework that I need to do for the class. For example, if I have politics reading due Wednesday and it is a Monday/Wednesday class I write the assignment on Monday. When I plan with it: It takes a lot of initial time to type everything in, but once you do you really don't have to do anything. I also like to use the cross through feature on word to strike through the things when I accomplish them. Here are the first 3 full weeks school. You can see the different assignments in the different colors and how I struck through them when I accomplished them. What I use it for: I also decided to print out another calendar which has when all my tests, papers, and other assignments that need to be turned in are due! Why I love it: I think this is great because it lets you see when your busy weeks are and also lets you just have another reminder of when the important things are done. When I plan with it: At the beginning of the semester I went ahead and printed out and wrote down all the important things. So now unless things change it is done. I know this seems probably insane and overkill to most of you, but to me it has really helped to keep me organized and actually has helped me to get ahead on a lot of my work. I'm not saying this will work for everyone, but I hope some part of this was helpful for you! I also tried to show you that planning your day out does not have to be a big time consuming thing, just a little bit each day is enough! If you have any questions at all please comment down below! Love all your calendars-nothing beats a old fashion desk calendar though! Thanks girl! I'm definitely a bit calendar obsessed!